Effective teambuilding is not merely a social exercise. In-depth analysis of all the factors influencing interactions between your team members is required to build high-performance teams. Your corporate culture is unique, and your teambuilding process has to be as well. Teambuilding is a highly individualized process where team members are challenged to rethink their strategies, processes, systems, and the way in which they work together to achieve organizational goals. One of the primary objectives of teambuilding is maximizing performance and realizing potential for all of your human capital. Effective teambuilding is your path to a successful and profitable enterprise. Leading requires insight into team dynamics -- not generic team dynamics, but the dynamics of your specific team, within your specific corporate culture. Teambuilding is the essential first step toward leading high-performance teams effectively. Maximizing the performance of teams requires that the underlying issues causing these behaviors be identified and resolved in a safe, non-judgmental environment. Team Goals - To clarify and identify the team's sense of direction and purpose to achieve goals. This may include: the team's values; vision; purpose; strategies; priorities; high performance management; taking ownership. Team Member Relationships - The effectiveness of a group in which members must work together to achieve results. This may include: clearly defining expectations; acceptance; support; individual involvement; diversity; conflict resolution; listening; and providing feedback to each other. Process and Procedures - The way in which the team works together to achieve goals. This may include: problem solving strategies; decision making processes; communication; the effectiveness of their meetings; analyzing performance; and, identifying behaviors that enhance and inhibit team performance. Role Clarification - An understanding of what is expected from each individual team member to accomplish goals. This may include: establishing roles; clarifying responsibilities; job structures; job designs; skills available; resources available; and accountability. 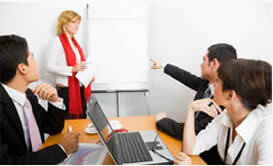 Leadership - The capacity of the team to work with their leader and to develop their own leadership effectiveness. This may include coaching; modeling behavior; management; flexibility of team members; rewards and recognition. Teambuilding for success and profitability, leading high performance teams to function effectively in your specific corporate culture, realizing human and professional potential, and maximizing performance: these are the activities and objectives that differentiate the great from the merely good. Contact Thorp & Associates to begin.